I am *kind of* a nerd for ancient Egypt. I find the Eighteenth Dynasty in particular to be utterly fascinating. In fact, all through middle school and most of high school I wanted to be an egyptologist. Turns out you have to go to school for a loooong time to be an egyptologist, and quite frankly I didn't want ot go to school at all when I was 17. While my desire to be an egyptologist has faded, my love of ancient Egypt has not. 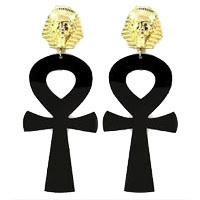 So when I came across these super rad Black and Gold Egyptian Ankh Earrings from Pixie Kitsune I was pretty stoked. Yeah, they are over the top, but that is what makes them amazing, right!? And even though I have no income right now, I can totally afford to spend 12 bucks.